This initiative aims to enable standardized data exchange and interoperability among different platforms via common data model. The announcement mentions Adobe Experience Cloud and Adobe Experience Platform, Microsoft Dynamics 365, SAP C/4HANA and S/4HANA will be covered by this. The resulting data will get stored in a common data lake on Microsoft Azure. The key issue is interoperability of data and a unified repository. There are several relevant use cases in Marketing, Advertising, and Customer Service. For example, If you are a retailer, you likely have customers who buy from your website and store, and then go to social media to review your products, say good and bad things about it, and may even raise complaints with your call center. Now all these different systems — your POS software, website, CRM, social media channels — build customer profiles and transaction data using their own format and structure. They have different repositories and different architectures and it is not a trivial exercise to link them across channels and systems. 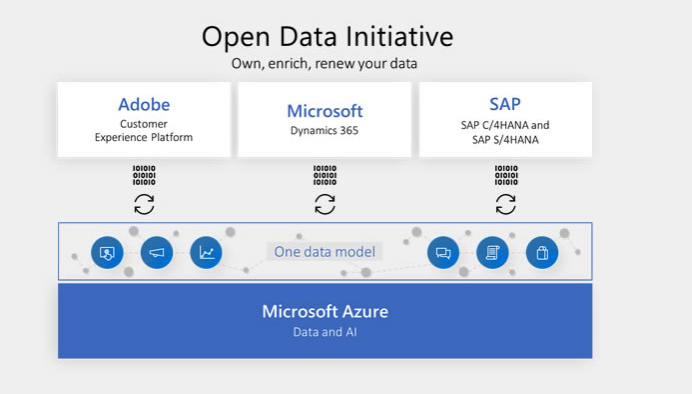 The Open Data Initiative seeks to address this issue by providing a common data model among some key vendors ( presumably with a common language and set of APIs - though we'll see about that) and then a data lake to store information that can then be used by other applications to run analytics, campaigns, or other data-heavy applications. Sounds good, but let's do some analysis before getting too excited. Standards haven’t really had a stellar record in the IT world, especially in some of the related marketplaces such as Information Management. We’ve seen several interoperability standards — such as CMIS — getting a lot of hype but not delivering. Interoperability standards have a strong case — they allow you to easily integrate and interoperate with other enterprise applications, they enable faster time to market because you can buy applications off-the-shelf, you can create portable applications, and so forth. But in real life, they suffer due to lack of ongoing support from sponsoring vendors, and several other technical as well as non-technical reasons. That doesn’t mean this Open Data Initiative will meet the same fate. In fact, I hope it is successful. But these are early days—it’s just an announcement and there are no timelines or deliverables as yet. Also, for a standard like this to be successful, more vendors need to support it and right now, several key ones, including IBM, Oracle, and Salesforce are missing. Don't Customer Data Platforms (CDPs) Already Do This? The exact architecture of the Open Data Initiative remains unclear, but in terms of intent, CDPs have the same objective, but bring the advantage that they are more marketer-focused and typically have more accessible datastores than some sort of wide-ranging data lake. On the other hand, the typical CDP may likely prove more limited in scope (particularly around analytics). Stitching together a unified customer profile from data and transactions across multiple channels — and then making those records and segments available for activation across multiple engagement channels — represents hard problems to crack, but several different approaches are emerging. Wait for the Open Data Initiative from Adobe, SAP and Microsoft to bear fruit. For now, it's intended to cover some of their products and provide a common data model along with a data lake that will likely require IT management. These are broadly capable underlying toolsets and could theoretically target non marketing use cases. Patience and much assembly required. Align with Salesforce. That vendor has announced "Customer 360" to create a unified profile across Salesforce’s own applications. Customer 360 is more of federation model (meaning data is not ingested into a persistent store); it provides a layer that maps data across applications via a data model of its own. This is a decent start but likely to prove limiting in practice (see RSG's research for more details). Deploy an independent customer data platform. These are offered by mostly smallish vendors who focus predominantly on marketing use cases. These vendors provide capabilities to ingest data from multiple sources, apply data management (cleansing, de-duping, segmentation) on that and then — to varying degrees — integrate with downstream marketing systems. What approach works for you over time will depend on several factors, including your use cases and incumbent martech stack. In the meantime if you are trying to address these sorts of challenges, RSG's CDP research can help. Our CDP vendor evaluations cover 20 providers across all these approaches. Download a free vendor evaluation to sample for yourself.